Trevor has been back to school for over a month but I can really tell it is back in session because of his middle school social activities. Friday afternoon - arrived home with 3 friends and they skateboarded, played video games, and were out and out rambunctious. Friday evening - Those 4 met 16 other friends at Battlefield Knoxville for a few hours of combat gaming. Friday night - He and a friend spent the night at another friend's house. Saturday Morning - Attended friend's football game. Saturday afternoon - He and a friend went to another friend's house where a bunch of other kids were. They played rough house type games (tackle tag, etc) outside and then ate a bunch of pizza. Saturday evening - He and a friend spent the night at our house. So we woke up Sunday morning and wanted to make something easy for breakfast that would fuel the boys' high paced weekend. 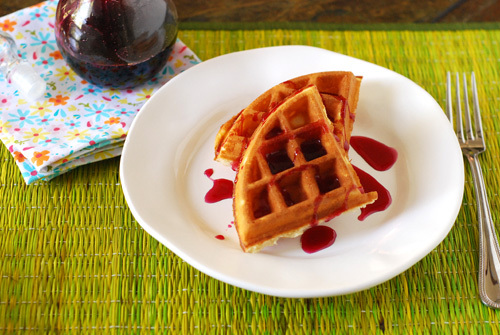 I made our usual waffles and this SUPER easy berry syrup. Place in a small sauce pan over medium-low heat. Stir occasionally until the sugar is melted, about 10 minutes. Slowly bring to a simmer and allow to cook for 15-20 minutes. Remove from heat and carefully strain through a sieve into a bowl. Slightly push down on the pulp in the sieve to get all the juice out. Discard the pulp. Strain a second time through cheese cloth. That's it. You're done. You can serve warm or chilled to let it thicken. 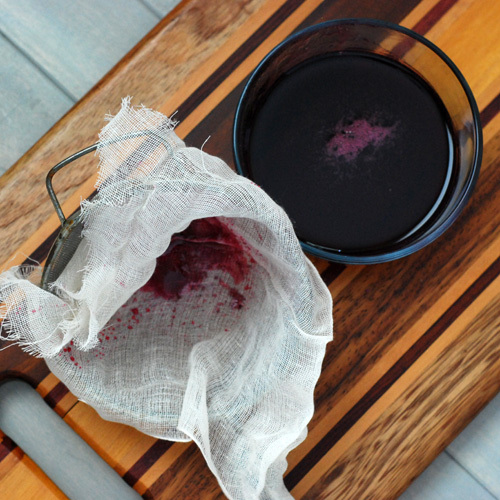 We used a cherry, blueberry, raspberry and strawberry blend that resulted in a multifaceted taste that we all found scrumptious. Don't skip the second straining. You want to get all the pits and seeds out. 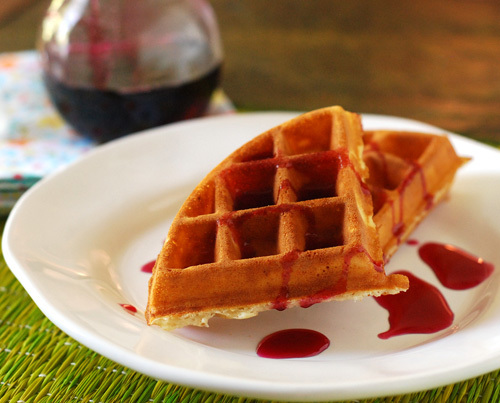 So easy and completely delicious! So it is now just afternoon. Trevor and his friend have gone to another friend's house. Go go go go. Red Bull has nothing on teenagers and their energy! I realize this has nothing to do with BBQ or grilling. But in a way it does. I'm roasting a pork loin this afternoon and I'm thinking of using a version of this for a mixed berry pork glaze.